A mother of two who threatened to post film footage of a woman smoking crack cocaine onto the internet unless she was paid thousands of pounds was jailed after admitting blackmail. Paris Padley used a false identity to contact the victim over Facebook and Instagram warning that the film would "go viral". Lincoln Crown Court was told that the victim, who lives in the Boston area, had no idea that the footage, which was filmed several years ago, even existed and initially ignored the threats. But after further threats culminating in a letter sent to her home address she went to police. Laura Pitman, prosecuting, said the film had been taken on an I-pad which was later stolen in a robbery. "It had been recorded on her then partner's I-pad at a time when she didn't know she was being filmed. "Some time later that I-pad was stolen in a robbery. Clearly the recording got into the wrong hands." Miss Pitman said that in September 2017 the victim was contacted on Facebook by someone using the name Kenny Smith. She ignored the initial request to be a friend but then received a message from "Kenny Smith" saying "We have footage of you doing something you shouldn't be doing. Unless you want your family and friends to see pay £5,000 or this will go viral". Miss Pitman said "She believed the message to be a fake so she simply deleted it. When she checked her inbox she saw four or five pictures, some of them showing her smoking crack cocaine out of a plastic bottle. She immediately deleted the pictures and closed down her Facebook account." 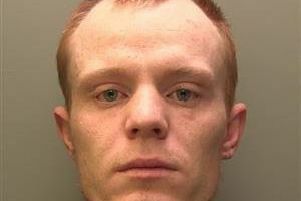 The victim later received a threat on Instagram from an account holder using the name 666devil and then a handwritten letter was sent to her home address demanding £5,000. As a result the victim went to police. The subsequent investigation led to Paris Padley after her fingerprints were found on the envelope which contained the threatening letter. Checks showed that the Kenny Smith account had been accessed by Padley's mobile phone. Padley,24, of Merton Drive, Rothley, Leics, admitted a charge of blackmail between 3 and 20 September 2017. She was jailed for eight months. Diane Mundill, in mitigation, said Padley had no previous convictions and urged that she should be given a suspended jail sentence. Miss Mundill said that Padley had a grievance against a man whom she believed was the partner of the victim. "Her actions were completely and utterly misplaced. She is remorseful. "The reason behind this was not an expectation of money. The purpose was to cause pain and hurt." Judge Simon Hirst, passing sentence, told Padley "Blackmail has been described as one of the ugliest and most vicious crimes in the criminal calendar because of the emotional impact on the victim. "It is the very nature of this offence that makes it so that only a custodial sentence can be imposed. I am afraid I cannot suspend the inevitable prison sentence."